The bird bath on the railing, with some rock. How it looked, prior to its move this weekend. In the last week or so I have has on going visits from bees, specificity honey bees. Now unlike some people, I have no fear of bees, and I also realize that they are so needed for pretty much anything that grow. My bird bath has become a watering hole for a few bees here and there. I always thought bees wanted fresh clean water. In my research online I found that they want water they can smell. So warm water, slightly muddy or with algae growing in or around it. This is water they can smell. Also bees can not swim. So they need to have plants, rocks, or bits of floating items to give them a platform to land on. My bird bath has a pile of rocks in it, most of them lava rock. 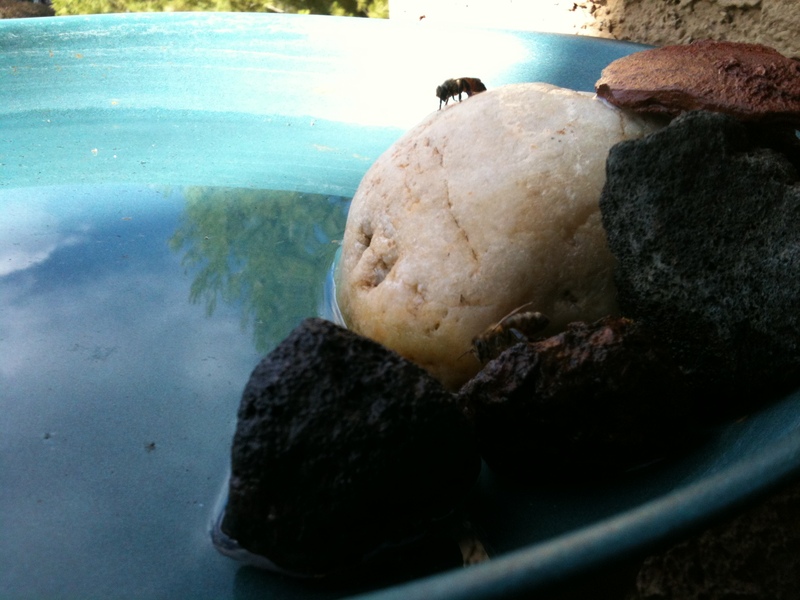 When the lovely ladies come to visit they seem to use the lava rock to help them get to the water. Today I changed the configuration of the bird bath. I have not been getting birds at it for almost a month. The population and diversity of birds has changed as it has gotten warmer. Since I no longer am catering to feathered visitors I thought I would move to accommodating the honey bee. I dropped a tea light in a small glass holder and put it into the water. It looks really neat in person, and not so bad in this picture. I don’t think I will get swarms of bees. As we get hotter here in California I am expecting to have a bit more traffic. Currently I have not put any water plants in. The bird bath is not going to be really roomy enough for plants like that. I have moved my little fountain so that I now have flowing water dropping down on some rocks. It is rather cute, I think.